Forget Candy Crush, Threes and Bejewelled! 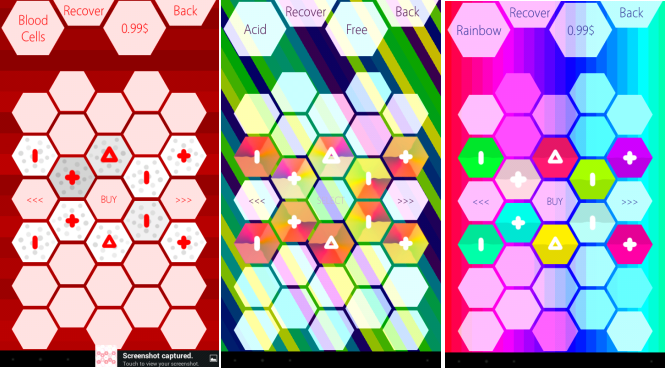 Polygon Evolution takes match-three puzzle to a superior level of style, complexity and intelligence, almost nearing chess. No more will your success depend on a random number generator. No more cartoon-ish graphics and Looney tunes sound scores. 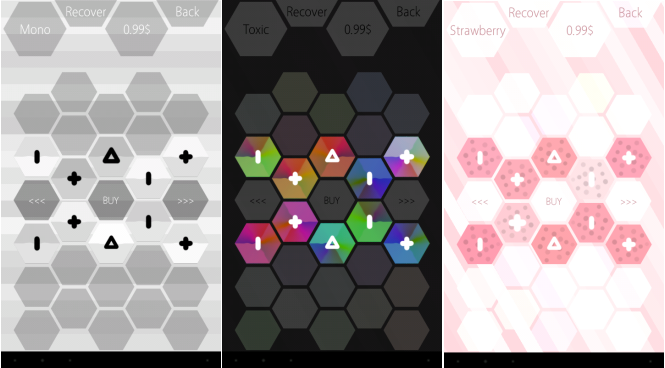 Polygon is a new challenge to your grey cells, and an aesthetic delight to your senses, blending cell-combining mechanics into an evolving grid, which in its turn affects the evolving and perfectly ambient sound score. Released in June this year, Polygon is a breath of fresh air for the fans of the puzzle genre, and those who play seldom, but appreciate a non-conventional challenge and a stylish design. A lot of thought and work has been obviously put in this game, which explains why it is so visually polished and intellectually gorgeous, so if you are willing to put your brain at work while playing, we recommend you check out Polygon Evolution. I wouldn’t rate Polygon as easy to pick up and play. No, there is a tutorial at the beginning, and you can go back to it any time, but don’t think it too hard, either. It just requires you focus, that’s all. Go through the tutorial attentively once, and you will grasp the rules and be ready to master the grid. It is both a match-three, puzzle and strategy wrapped in one. You are given an abstract-styled colorful grid of hexagons, most of which are blank, and your goal is to make the grid evolve. I will try to explain how, but it’s better explained in the tutorial with the illustrations, though. There are dots, dashes, pluses, triangles, squares and hexagons. The player can only produce dots from blank cells adjacent to the filled cells, irrespective of their symbol. Three dots in a row collapse and create a dash. Three dashes in a row merge and create a plus. Three pluses in a row merge and create a triangle, which is a spectacular geometric show. The procedurally generated sound track accompanies each move you make. The first difficulty you face is the grid itself – it is not so easy to build three dots in a row since the grid is not even, but a bee cell type, so you can easily misplace the dot, especially at the beginning while you learn. The second challenge is to remember which direction the cells are merging. It’s rather simple, though, because they merge into the one that was last placed. The same rule applies to the merging dashes, pluses and triangles, and this trick makes me lose time and time again when I lose focus. There is another aspect to the game, which is not immediately obvious and becomes evident when you play against AI or your local opponent. It’s about controlling the grid territory, and the quicker you manage to block your opponent’s room for growth, the better are your chances of winning. Once you find yourself locked in a position where you can no longer build match-three pieces, you are done. The diversity of game modes is stellar. 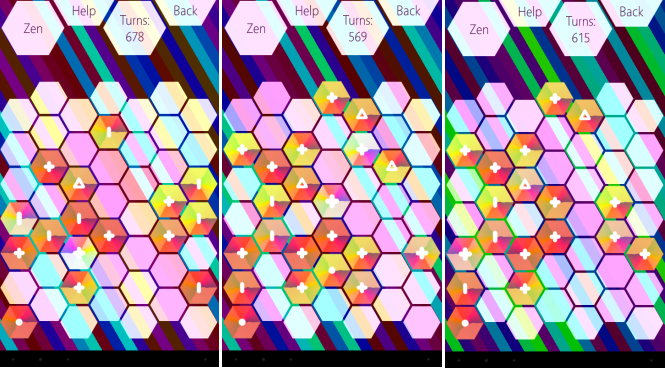 My favorite for now is Zen, which is great for beginners mastering the grid. You just play on your own, enjoying the core of the game, mastering the rules and marveling at the visuals and music. Classic mode introduces an additional challenge – AI, which takes turns with you and plays with black cells. It’s a very interesting twist, which will make you bite your lips and scratch your head once in a while. There is an additional set of rules to the mode, since both opponents can consume each other’s cells. Then there is the local Multiplayer mode, which is great for those of you who have an opponent willing to accept the bee cell challenge. As challenging as I felt the game was, even a preschooler can play against an adult, provided the type of game matches his or her mind set. 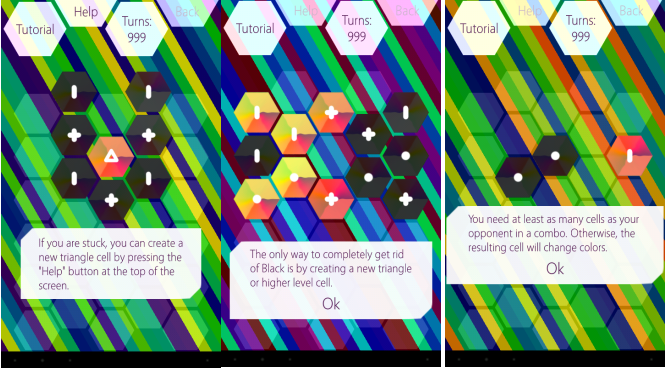 Finally, there is an Expert mode, which can be unlocked by creating a hexagon cell in Classic mode. As of now, it seems like a super-challenging task for an average player. In any mode, you will need to plan ahead, otherwise you will have all the grid filled in no time. There is no place for luck here. Each time, a new grid is generated with randomly positioned initial set of dots and dashes, and you have to proceed from there. You can exit the game and come back to it later – your progress saves automatically. Alternatively, you can reset the game. Each game mode has to be reset on a separate basis. You have a limited number of turns you can take, and once they are exhausted, you will have to wait for them to replenish, or buy more via in-app purchases. I am not quite sure how much and how often they get replenished, but at the beginning I had some 999 turns, which I exhausted in one learning day, and the next day I had 180, or something along those lines. It seems quite fair, and encourages players to think carefully rather than rush recklessly. The Help button gives you a saver-triangle, which consumes and frees up much of the grid, but beware – it’s not free. One such triangle will cost you $0.99. The same $0.99 price tag is attached to every color and music theme in the shop. There are 12 beautiful color themes, and the default is available free of charge, while you can purchase the others via in-app purchases. Even without the IAPs, there is a great diversity in the skins of the grid, and each game mode is graphically different. The colors are visually gorgeous and create a spectacular image, but there is catch here – it’s distracting, too. The rhythm and procedurally generated sound score seem to increase with every turn you take, and the symbols vibrate with the beat, which only adds to the distraction factor. It only stops being a distraction when you get used to it, and learn to focus on your strategy. Polygon is a geometric visual delight, and when folks says there is beauty in math, Polygon is one of the manifestations of that beauty. In the local multiplayer mode, it is easy to lose track of whose turn it is, which gives way to extra blunders when your opponent takes your turn by accident and messes up your plan. It would be nice to see an indication which color moves next. 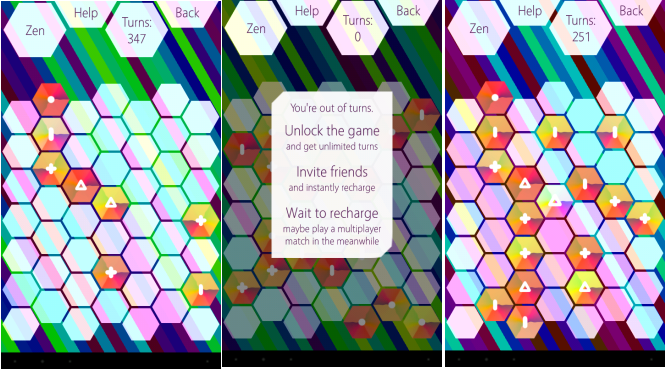 Polygon Evolution is a new match-three puzzle and strategy game, which is both visually gorgeous and strategically challenging. It suggests a moderate learning curve, but at no point in the game will you feel bored. It’s an engrossing spectacle, difficult and very rewarding when you succeed, and we totally recommend you take the time to pull that string and see what beauty hides behind the hexagonal grid of scattered symbols. The developer claims it took him long months and 4 prototypes to reach the current level of perfection, and we believe this beautiful gem of a game deserves your attention. If you prefer quick and clean-cut puzzles, though, you might feel a bit frustrated because Polygon requires dedication, but rewards the persistent player with utmost feeling of intellectual satisfaction, which is far more significant than any in-game eye-candy. Polygon Evolution takes match-three puzzle to a superior level of style, complexity and intelligence, almost nearing chess. It's difficult, but engrossing and rewarding once you get the taste of it.